Bermejo’s Saint Michael Triumphant over the Devil JOSEP LOSADA. Bartolomé Bermejo must have had an extraordinary ego. Like today’s elite footballers who train behind closed doors or rock stars who will not perform without a dressing room filled with oysters and French champagne, he also made eccentric demands to paint. For example, nobody could enter his workshop. And if there was something he did not like he would leave the project half finished – many of his patrons, who paid him fortunes, cursed his name. Today he would surely attract similar sentiments: admiration, distrust, envy and even fear. Why? Because he was very good, and very different. Little is known about the life of the most talented Hispanic painter (and one of the best in Europe) of his time, a 15th century stuck between the old and the new worlds. But a small group of his paintings that have never before been shown together are now on display at the Palau Nacional until May 19. In Desplà, Bermejo found an accomplice for his creative destiny. And in all likelihood the shield that someone like him needed, being persecuted as he was by the Inquisition. Desplà opposed its introduction in Barcelona, not due to any progressive ideology, but to protect his immense power from the Castilian Church. Bermejo returned the favour with a very unique painting for his private chapel (private, but always open to visits by notable figures), a work that was incomparable with anything done prior to then. And precisely because of this innovative character of his, it would not be understood as a strictly religious painting. “It’s a visual spectacle,” says Joan Molina, curator of the exhibition, and includes an unusual repertoire of up to 73 different animal and plant species. 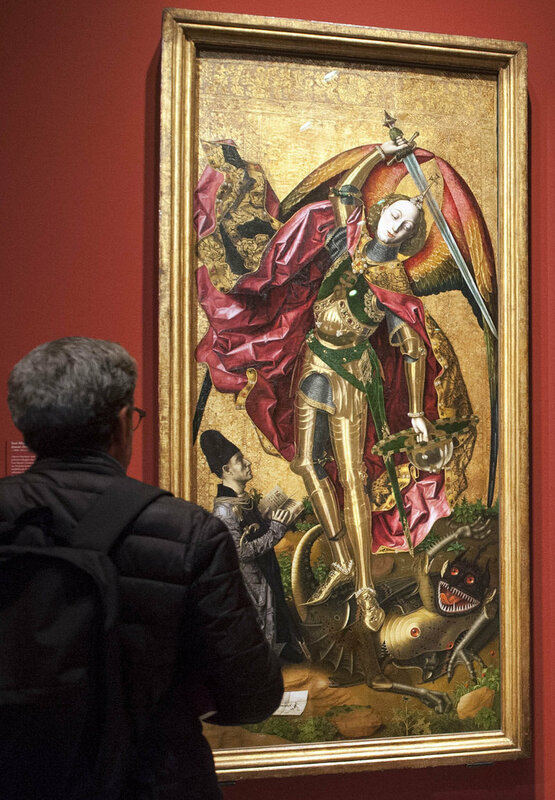 The painting, which is owned by the cathedral, was restored a couple of years ago thanks to the patronage of the Banc Sabadell Foundation, which has also now collaborated on the exhibition. Bermejo’s virtuosity shines with its own light at the MNAC, and more so when cast alongside the work of his contemporaries, which was “most inferior”, Molina says.